If you&apos;re interested in volunteering in this destination, please contact us first before applying. 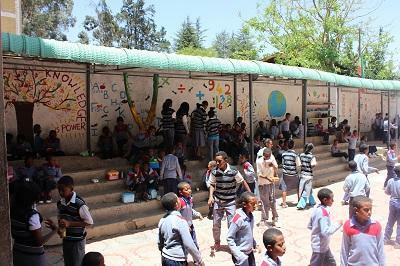 On our Teaching and Community Project in Ethiopia your group will assist local teachers in primary schools and high schools. As part of our long-term development goals, your group will be involved in helping to improve the learning environments for the students. Teaching English in Ethiopia is an ideal way to help out in some of the country’s most poorly resourced schools. Your groups help will be greatly appreciated, especially when it comes to giving students vital individual attention to support their studies. It is also possible to teach French in Ethiopia, so please let us know if your group is interested in this option when you apply. Projects are available for anyone interested in volunteering in the developing world; whether you are a school group, university group or corporate group. The impact that your group have on the lives of the students you teach will be long-lasting. However, you will also be part of a much wider volunteer network, which is making a really positive contribution to the communities in which we work. Only two decades ago, Ethiopia was ravaged by massive famine and cruel conflicts that left the population decimated and facing a bleak future. In the last few years Ethiopia's government has made both Education and Health its top priorities. New schools are opening all the time, and the aim is to dramatically increase the number of children attending primary and secondary school. However, there is a long way to go. Recent published reports estimate that 68% of children attend primary school and just 16% complete their secondary education. The rapid growth of the capital, Addis Ababa and the emergence of a small Ethiopian middle class have made learning English a necessity for students wanting to enter into higher education, or to find a job with one of the capital's many international employers. English teaching in all schools is now being accorded increasing importance, particularly by the new generation of young, ambitious Ethiopians who are striving to improve their country's place in the world as well as their own. Volunteers usually find themselves assisting with other subjects, as well as running extracurricular activities such as arts or sports. If any members of your group have any special interests or skills, do let us know when you apply. We will then try to match you to a school where your group’s talents will be put to good use. Projects Abroad also offer specific school sports placements, if you think your group will be better suited coaching children than working inside a classroom. Your time will be split so that in addition to spending time teaching you will also be able to have a lasting impact on the school itself, by helping with painting and renovation work. Other activities might include helping out a local community with rubbish clean-ups, teaching or hosting cultural events.